Just west of the Niagara Falls lies Hamilton and the home base for Candadian rockers Radio Free Universe. Started in 2010 by vocalist and songwriter George Panagopoulas, guitarist Ryan Davie, and drummer Ashton Norman the band delivers their debut album Casa Del Diablo, with new bassist Adam Neumann, and mixed and mastered by Glen Robinson (Voivod, Gwar). 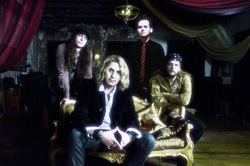 Radio Free Universe may be a modern hard rock band, but they are heavily rooted in classic rock, even retro rock. Their sound is a sweet merger of Eighties classic rock with some Seventies blues and groove and maybe a touch of post grunge d-tune. The songs are equally heavy and bristling, thick brisk riffage being embraced by a deep bottom end of rhythm and groove. And they do most of this in three minutes, or sometimes much less. The songs are packed full no wasted riffs or beats Lyrically, Panagopoulas writes from his experience of living in the United States for some time (which means from an American's perspective he probably doesn't understand us at all). As for the songs, you can't miss the downbeat and groove rampant in most every song. Heavier riff and bass busting numbers come with American Gun, DMT, and Dirty Little Things. You'll feel and hear that blues groove within Rhythm And Bones, 18 Wheels, Magnolia Girl, and the acoustic guitar driven Armageddon Road. With Disclosure, perhaps the best song here, you get the bounce of AOR accessibility, thanks to the superb blend of catchy riffs, monster groove, and a melodic and varied vocal arrangement. 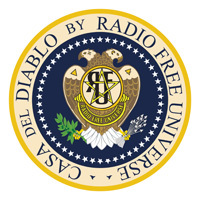 Essentially, Radio Free Universe and Casa Del Diablo rock the new century by making the old school the new school with their heavier, bluesy melodic hard rock. Try to keep up. Recommended.